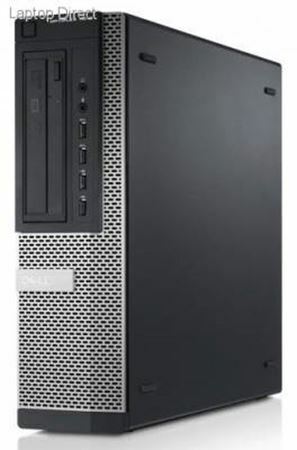 Work efficiently with the OptiPlex 7010 desktop, featuring 3rd Gen Intel® Core™ processors and advanced IT control. Work efficiently with the OptiPlex™ 7010 desktop, featuring advanced performance, flexibility and connectivity to help your business succeed. Harness 3rd Generation Intel® Core™ processor options including Intel® Turbo Boost Technology 2.0, ample storage, Intel® HD graphics and high-bandwidth memory of the OptiPlex 7010. Work comfortably with a system that enables you to customize your workspace with intuitive design, multiple display options and flexible configurations for your peripherals. Collaborate and share data through VoIP1 and Microsoft® Lync. Effective management of your office environment is within reach. The OptiPlex 7010 enables IT administrators to take total control over system management and security protocols, and offers the stability needed to effectively plan for the future. Efficiently manage your desktop fleet. Achieve unprecedented IT control in your workplace. Intel® Core™ i7 vPro™ processor remote out-of-band management, image sharing between desktops and Dell’s remote BIOS management functionality help increase IT efficiency. Enable data security across your organization. Help protect your critical data and meet compliance standards with Dell Data Protection2 and Trusted Platform Module (TPM)3 encrypted hard drives and other security features. Enjoy the peace of mind provided by business-class stability and support. As your business grows, hardware stability and support are the key to budget management and forecasting long-term needs. Help IT focus on the most important projects with Dell ProSupport™ and Dell Deployment Services. Built to last and designed to fit your workspace, Dell OptiPlex desktops offer durability and style. Your business requires a desktop that can handle the toughest jobs. Ensure long-term reliability with durable, serviceable Dell OptiPlex desktops. Dell OptiPlex systems are designed to integrate seamlessly into virtually any office environment, on virtually any size desk, and with a consistent look across all models. Help minimize energy consumption and encourage conservation with the ENERGY STAR® 5.2 compliant OptiPlex desktops, featuring highly efficient power supply options and environmentally conscious design features.